From the first page to the last page, I was totally fascinated with Nechama Leibowitz’s profound perspectives in Benjamin S. Yasgur’s book, “Torah Conversations with Nechama Leibowitz“. Within some of the basic and well-known passages from the Bible, Leibowitz demonstrates, through her intimate viewpoints a more clear understanding of Torah. Her opinions motivate the reader to constantly question in order to seek possibilities and/or answers. Her underlying ideals are apparent throughout the pages. Leibowitz was an extremely religious person, and one whose foundation was steeped in ethical and moral responsibility. Torah study was supreme in her life, and she believed it was the path to understanding and illumination of humanity, encompassing the satisfaction and rewards of learning. From thoughts on Moses, Eliezer, Isaac, Esau, Jacob, Rebecca, and more, her teachings reveal a woman whose life was steeped in reflections regarding the Bible’s characters, including their human flaws, and their strengths. Idolizing these individuals was not in Leibowitz’s scheme of things, because each one of them had their own shortcomings. Leibowitz’s own thoughts on Rebecca reveal that she was a woman who eventually commanded Jacob, to protect himself, stated firmly, as his mother, and spoken as a woman deserving parental respect. 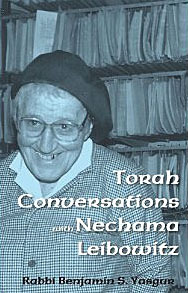 I inhaled all of the questions, answers, thoughts and feelings within the pages of Torah Conversations with Nechama Leibowitz, by Benjamin S. Yasugr. I found it to be compelling, profound and filled with insight and filled with educational importance. It gave me a more in-depth understanding of the biblical individuals she encompassed within the conversations, telephone calls, correspondence exchanged, and visits undertaken by Benjamin S. Yasgur. The journey throughout the pages was enlightening and inspiring. I know I will refer to it often. I highly recommend this thought-provoking book to everyone.